Lizard hunting season in Saudi Arabia starts with a bang, as young men in Buraydah head to the desert to seek out the reptiles. The dry and arid land here is the ideal habitat for the dabb lizard, also known as the spiny-tailed lizards. The reptiles live in holes and small crevices, and in order to escape the harsh heat or danger they hide themselves underground. But despite their subterranean lifestyle, the hunters here have found ways to capture them. Saudi lizard hunter, Majed al-Matrudi, explains the different techniques. “There are several ways to hunt the dabb lizard, one is to let it sink in water by pouring water into the hole and forcing it to come out, another way is by chasing it and hunting it especially if it is far from the hole, the other way of hunting it is to use a firearm,’’ said al-Matrudi, having successfully killed a lizard. But due to the popularity of hunting the reptile, its numbers are dwindling, and locals here are keen to limit the number of dabb killed here. Local officials have limited the season, so as to increase the population of dabb lizards in the desert. 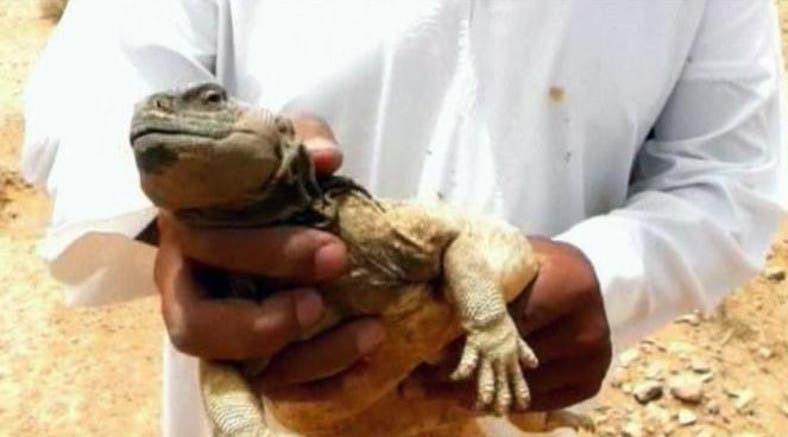 “It is our hobby as young Saudis to hunt lizards, but we advise people not to overdo it in order to preserve this hobby and so that the lizards can continue to exist in our land,” added Al-Matrudi. The scaly Lizard, may not look appetizing to some, but it’s seen as a delicacy in Saudi Arabia and other parts of the Middle East. “The meat of the lizard becomes delicious in the spring season because the lizard feeds itself from the spring plants and therefore it’s taste changes as a result of that. This is the period during which it becomes delicious,” said lizard hunter, Hammad Al-Fawaz. After a successful day’s hunt, the men sit down to prepare their feast. Cooking the meat and serving it with rice. According to al-Fawaz, you only need to try it once and you’ll want more. “When people see the shape of dabb lizard, they think that it isn’t tasty, but once they taste it for the first time, they would defiantly ask to eat it again and they would even ask to go to hunt it during the season,” he added. Despite the appeal of the lizard’s meat, doctors warn against over indulging in it as it is high in cholesterol and protein.